If you choose to refinish wood cabinets by painting you are making a wise choice. Paint is one of the easiest mediums to work with as well as one of the most budget friendly. However there are some things to consider before beginning the process of painting wood cabinets. 1) Do you have a lot of time to invest in this project or do you need it done right away? If you need your cabinets finished quickly then you should definitely wait until you have a good long while to take on this project. 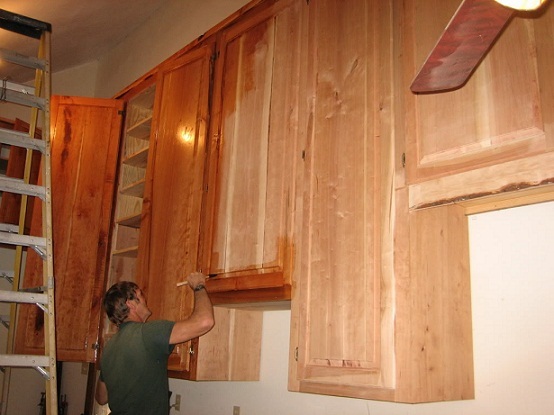 When you choose to refinish cabinets by painting there are many steps involved in preparing for this process in order to assure a quality appearance. Make sure to give yourself plenty of time so you are not rushing the process- which can be time consuming. Although it is not a tough job it is time consuming and requires alot of patience. If you don't have to time to prep and paint and wait 4 hours between coats, consider hiring out the painting job to speed up the process. In the long run, it will still be less costly than new cabinets. Below is a source for free quotes on this project. 2) While you are in the process of planning determine how much 'stuff' you have in and on your kitchen cabinets. The contents will need to be completely removed before you begin to refinish wood cabinets by painting. Finding temporary storage space may be tough considering all the food items,dishes and pans a normal kitchen holds. 3) Delegate storage space for your cabinet doors as well which will have to be removed before the painting process begins. Since you will probably be painting these as well you might consider placing these on a table in the garage or workshop. 4) After removing a cabinet door put a color sample on the back of a door in a hidden spot to see if you like the paint color on your species of wood. If glazing cabinets, paint a glazed sample on top as well to get an idea of how the color will look. 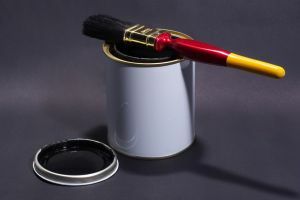 5) When refinishing wood cabinets by painting make sure to read through the instructions on the back of the cans to determine dry times of primers, sealers, paints and glazes. Give yourself plenty of time after each step to assure that complete drying occurs. Attempting to begin another step before the last step has dried can ruin the look you are attempting to create. Looking for step by step instructions to refinish wood cabinets by painting? Click below for detailed help.